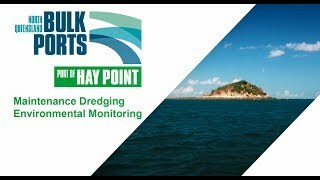 Environmental monitoring and management measures will be implemented throughout the Hay Point maintenance dredging program to minimise the impact on the marine environment. This includes real-time, publicly available water quality monitoring data via an online dashboard. NQBP’s assessment reports have found the risks to protected areas including the GBRWHA and Great Barrier Reef Marine Park are predominantly low. NQBP’s Environmental Risk Assessment and Marine Environment Monitoring Program provides further details on the environmental risks and monitoring requirements. Based on a sound understanding of the natural environmental conditions and thresholds in the local area, a series of response triggers are monitored to ensure that dredge related conditions outside of natural ranges are avoided or stopped before they occur. Monitoring of marine water quality, weather conditions and megafauna will be undertaken as part of Adaptive Monitoring. NQBP in partnership with James Cook University’s (JCU) TropWater unit have used three-years of ambient water quality monitoring data to establish the Intensity, Duration and Frequency (IFD) of naturally elevated turbidity (water clarity) in the Hay Point and Mackay region. Four of these ambient monitoring sites are being used to provide real-time (every 10 minutes) water quality (clarity) data. These four sites include – Slade Island, Round Top Island, Victor Island and Freshwater Point. Trigger sites – Round Top and Victor Islands are the closest water quality monitoring sites to the dredging and placement activities. Consequently, these sites are the focus of adaptive monitoring during maintenance dredging. Control sites – Slade Island and Freshwater Point are located further north and south respectively and will be used as control, or reference, sites. The intensity thresholds from the Marine Environment Monitoring Program were based on 3-years of ambient water quality monitoring taken from loggers on the sea-floor. These intensity thresholds have been adjusted lower on the dashboard in line with water quality monitoring undertaken through surface water quality loggers which are required in order to provide real-time data. Further information on how the surface logger intensity thresholds have been calculated from the sea-floor intensity thresholds can be reviewed here. (Turbidity units include SSC = Suspended Sediment Concentration and; NTU = Nephelometric Turbidity Units). On the Dashboard (pictured below), if the water quality is below the 92nd percentile intensity at a site it is represented by a green circle icon. If the water quality is above the 92nd percentile intensity at a site it is represented by a yellow circle icon. Yellow does not necessarily mean bad, but just that the water quality is at the higher end of natural water quality conditions. The real-time turbidity (water clarity) value is also provided to the right of the Dashboard screen. The Intensity, Duration and Frequency (IDF) of naturally elevated turbidity (water clarity) in the Hay Point and Mackay region was established using three-years of ambient water quality monitoring data. The adopted water clarity Intensity thresholds for each of the four monitoring sites have been described above. Duration is the period of time that a certain Intensity level is exceeded. Frequency is the number of times that a certain Intensity level is exceeded. To account for Duration and Frequency, the cumulative amount of time (in hours) is used to measure the amount of times that the Intensity threshold is exceeded. Maximum – the highest recorded cumulative time the intensity threshold is naturally exceeded over the given time period. These Duration thresholds (in hours) are only required for the trigger sites – Round Top Island and Victor Island. For the proposed 40-day maintenance dredging program the following duration thresholds apply. Indicative Management Zones based on these Duration Thresholds are shown below (refer Figure 8 MEMP). The Dashboard displays the total number of hours that the Intensity thresholds have been exceeded and the black square at left of horizontal bar chart will extend to the right as these hours increase. These hourly increases may be a result of natural conditions but will be used in the adaptive management process. The Dashboard also represents the Management Zones using the same colours (green, yellow, orange, red) as the figure above. Each Management Zone is based on the number of cumulative hours the intensity threshold has been exceeded. When you hover your cursor over the bar chart in the Dashboard, the Management Zone title and hour range will be displayed. The Adaptive Management Response Actions include no action being required, investigating further, responding, or stopping dredging. For more detail, see here. The above scenario is for Southerly winds. Victor Island and Slade Island are the trigger and control sites respectively for Northerly winds. If the ‘Respond’ management action level has been reached the Management Reference Group will be consulted. As part of the adaptive management program, NQBP has established a Management Reference Group (MRG). The MRG will be an advisory group to be consulted in the event of any parameter reaching the ‘Respond’ management action level. The MRG is comprised of NQBP staff, coal terminal staff, regulatory agency representatives, scientific experts and the dredge contractor. The role of the MRG will be to review the information obtained from the adaptive monitoring program and where there are unusual or unexpected results advise NQBP on the best course of management. In addition to the MRG, NQBP will also provide updates to the established Technical Advisory and Consultative Committee (TACC) during dredging operations. You can view the Trailing Suction Hopper Dredge (TSHD) location, it is represented by a blue circle on the Dashboard map. Where is the material being placed? The built-up sediment, which comes from the sea, will be relocated at sea, 6km away from port operations. This is the Dredge Material Placement Area (DMPA) used in the past and is within defined port limits. Marine megafauna includes whales, dolphins, dugongs and turtles. The dredge vessel which NQBP is using has features such as under keel discharge, green-valve technology and turtle deflectors to reduce the risk of harm to marine life. Before beginning all dredging and placement activities, the dredge operators will use binoculars from the vessel, to look for marine mammals and/or turtles within the monitoring zone. If any marine mammals and/or turtles are sighted in the monitoring zone, dredging and placement activities must not commence in the monitoring zone until 20 minutes after the last marine mammal and/or turtle is observed to leave the monitoring zone or the vessel is to move to another area of the approved Dredge Area or Dredge Material Placement Area (DMPA) to maintain a minimum distance of 300 metres between the vessel and any marine mammals and/or turtles identified.